Note: Some of the roads are not very “user friendly” this time of year, be prepared. Planning our St Patrick’s Celebration at the Yellow Pine Tavern for Saturday March 16, 2019 at 4pm. Potluck Corned Beef and Cabbage provided by the Tavern. It’s time to plan for the annual 4th of July Yellow Pine Golf Tournament. This year the proceeds will support the Community Hall and road repair. There will be prizes for first, second and third places for men’s women’s and mixed. Also, there will be a prizes for closest to the pin. Spots go quickly, so be one of the first! There will be a hearty breakfast at the museum from 8-10. The cost is $6 and all proceeds benefit the upkeep of the museum. The 2019 schedule for the Yellow Pine Escapades has been updated on the website! Expect new escapades this coming year, including an ATV-UTV Photo Scavenger Hunt; two (yes, two) ATV-UTV rides, a golf tournament, and even a community yard sale. Other events will be added to the calendar as plans are finalized. We had 13″ of snow fall over 4 days last weekend, by Monday morning we had 31.5″ of snow on the flat. A report that a slide came down on the highway on Big Creek summit blocking traffic for several hours Monday afternoon/evening. By Wednesday morning we had received an additional 4″ of new heavy wet snow, then it rained for several hours. A report of white-out conditions on Warm Lake Highway, and the mail truck was unable to make it in. Thursday and Friday we picked up an additional inch of snow. The snow out on the flat by the school/museum is getting “pillowy” and ranges from 25-28″ deep. The mail truck made it in on Friday with a very large load of mail and freight for the village. The Valley County Planning and Zoning Commission will hold a public hearing at the Valley County Courthouse in Cascade, Idaho, on March 14, 2019, to review the application. Please direct questions and comments to Cynda Herrick at the P&Z office. Comments must be received at least seven days prior to the public hearing. CUP 19-01 Valley County Quarry Yellow Pine: Valley County Road & Bridge Department is requesting approval of an expansion of the existing CUP 10-3 Valdez Quarry. The expansion would be south onto approximately 5 acres of the USFS Boise NF. Rock material extracted from this quarry would be used as cover material for road maintenance. Upon completion of the quarry activities, both portions would be reclaimed, re-contoured, and re-vegetated. Access would be via a private drive off Murphs Ave. The Cemetery Committee is interested in any information on the cabin that is located by the cemetery. We know that it had been on the property that was known as “Mary’s Cabins”. It was moved by Tom Richter while the Filler’s were building their house. Donna Valdez said that the people who ran the cafe and bar slept there, before the Tavern was built. Do people have pictures or any information they can share? We’d love to put a plaque up on the cabin while we repair it. Many thanks to the hard working county plow drivers, they are putting in long hours, dealing with a lot of snow, equipment failures and many miles of rural roads. Asking folks to be patient until they can get time to bring a grader in to widen and plow ice on the upper South Fork Road. Spring break-up may be messy. Note: report that the dumpsters are full. No report on when Lakeshore will come empty them. Please do not abuse our Transfer Station or we may lose it. Household trash must be placed in the bins, flattened cardboard boxes can also go into the bins. Do not stack trash in front of the doors. Woody yard debris only for the burn pile. 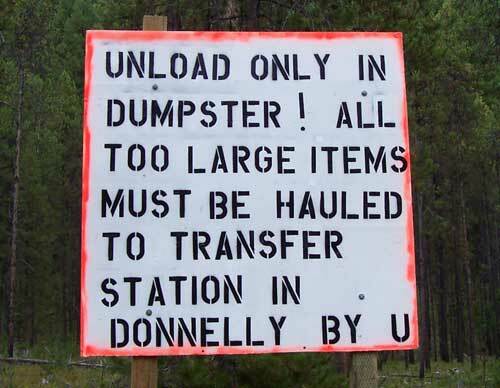 No furniture, appliances, tires or construction debris allowed, those items must be hauled out to the Donnelly station by you. Fresh fox tracks this last week. Mountain lions sightings in the McCall area a few weeks ago. Please do not leave pet food outdoors and remember to keep trash secured, it will draw foxes, coyotes and loose dogs. To help prevent frozen water, avoid parking over buried water lines, allow the natural snow cover to insulate the ground. Driving over the lines will also push the frost deeper and can result in frozen pipes. Also, don’t plow the snow over where water lines are buried, and avoid covering up water shut off valves. June 8th; July 20th; August 10th; September 14th. Note that the July 20th meeting is not on the second Saturday due to a conflict with a planned ATV rally involving many residents and visitors. Fire Department Training on Sundays at 11am will resume in the Spring. The YPFD has 2 Size Chimney Brushes with extension rods that were donated for use around YP. If you would like to borrow one, please contact Cecil or Jeff and we’ll get them for you. The YPFD also has loanable mitigation tools, (Weed-Whacker, Hedge Trimmer, backpack blower and 16’ pole saw). If you would like to borrow one or all, please contact Cecil or Jeff and we’ll get them for you. It’s also time to check the Smoke Alarm batteries and Fire Extinguishers. Please test the alarm and replace Smoke Alarm Batteries every year, if you have the replaceable battery type. Fire Extinguishers should be checked as well and should be easily seen and reachable. A good location for the Fire Extinguishers would be the kitchen and near the wood stove and/or fireplace. The needle should be in the green. If you need a Smoke Detector or Fire Extinguisher for your YP residence please contact Jeff F.
Winter Hours at the Tavern: 9am-2pm and 4-8pm Mon, Wed, Fri, Sat and 9am-2pm Sun. Or call 208 633-2233 the phone rings into the house. Diamond Fuel & Feed (208) 382-4430, Suet blocks (peanut crunch, and cherry) for $1.99 per block. 50# bag of Polar Ice Melt available for $7.99. Monday (Feb 25) we had quite a bit of snow in the last 24 hours, overnight low hovered around 28 degrees, 6 1/2 inches of snow fell in 24 hours, measured 31 1/2″ of snow on the ground this morning – and still snowing. New porch visitor this morning, a male red-winged blackbird joined the jays, juncos and woodpeckers at the feeders. Snowing and blowing mid-day, icicles dripping, high of 35 degrees. Mid-afternoon still breezy, rain/snow mix and low clouds. All rain late afternoon and early evening, low clouds and breezy at dusk. Snowing by 10pm. Snowed until 5am. Tuesday (Feb 26) overnight low of 29 degrees, high overcast and breezy this morning, 3/4″ new snow and around 28″ total snow on the ground (a few low spots measured 24″.) Red-winged blackbird is back and brought a friend along with jays, juncos and hairy woodpecker. Mid-day icicles dripping and cloudy, high of 36 degrees. Flaking snow at 2pm. Mid-afternoon lightly snowing, low clouds, almost calm and just below freezing. Heard a raven calling. Still flaking a little snow at dusk (trace) and quiet. Snowed all night. Wednesday (Feb 27) overnight low of 27 degrees, 4″ new snow, 31″ total snow on the ground, low overcast and steady snow this morning. Juncos, jays, a red-winged blackbird, a white-breasted and red-breasted nuthatches, a starling, hairy woodpecker and northern flicker visiting. Half inch new snow by 11am and rain/snow mix. Mail truck could not make it in today, had to turn around at North Shore and go back (blizzard on Warm Lake hwy.) By mid-afternoon there were breaks in the clouds and a little sun once in a while, high of 42 degrees. At dusk it was still above freezing, very damp air and cloudy. Thursday (Feb 28) snow after 6am, by 10am 1/2″ new snow, 28″ total snow on the ground, overcast and still snowing. Lots of juncos, several jays, a hairy woodpecker, northern flicker, a white-breasted and a few red-breasted nuthatches visiting this morning. A few breaks in the clouds mid-day, icicles dripping, high of 39 degrees. Mid-afternoon snow shower and breezy, mostly cloudy sky (blue patches surrounded by dark clouds.) At dusk it was partly clear to the south east, but dark clouds to the west and north west and quite breezy. A trace of snow fell after dark. Clearing after midnight and stars out. Friday (Mar 1) overnight low of 7 degrees, measured a scant 1/4″ of new snow and 28″ of old snow on the ground, broken cloud cover this morning. Jays, red-breasted nuthatches and juncos visiting this morning. Internet outage before noon, MTE says the outage is widespread, not just YP, back up by around 1pm. Mail truck was a little late, slow trip in. A clarks nutcracker joined the jays and juncos at the feeders. Local with backhoe moving big piles of snow. Mid-afternoon snow flurry, icicles dripping, high of 33 degrees. Thinner clouds at dusk, except the top of VanMeter socked in, calmer – not as breezy as the afternoon. Calm and cloudy at midnight. Saturday (Mar 2) overnight low of 11 degrees, a trace of snow fell before 9am, total snow measures 28″, broken clouds and flaking this morning. Hairy woodpeckers are drumming on power poles, pine squirrel, jays, juncos and nuthatches visited this morning. Fresh fox tracks in the neighborhood. Northern flicker and clarks nutcrackers along with jays, hairy woodpeckers, juncos and nuthatches stopped by for lunch. Broken clouds and a bit of sun, breezy and icicles dripping mid-day, high of 39 degrees. By mid-afternoon bigger breaks in the clouds, warm sunshine and lighter breezes. Dropped below freezing before dusk, mostly cloudy – a few patches of clear sky. Mostly cloudy cold night. Sunday (Mar 3) overnight low of 11 degrees again, partly clear sky this morning with a light chilly breeze. Pine squirrel, jays, juncos, hairy woodpecker and red-breasted nuthatches visiting. Mostly sunny mid-day, icicles dripping, high of 36 degrees. Fat little white-breasted nuthatch visited early afternoon. Mid-afternoon mostly clear, light breezes, icicles dripping and very quiet. Mostly cloudy at dusk, puddles freezing up. John F. Lance, 78, of McCall, died February 15, 2019. Closed Roads: Do you know what to do in case you get stuck in snow? Idaho Falls, Idaho (KIFI/KIDK) – As the week goes on and the snow starts to settle, more people are able to use roads like Highway 20 or Highway 87. That also means people who have been stuck for a few days can get back home. … AAA Idaho said that if you find yourself driving through snowy conditions or severe winter weather, you want to make sure you are prepped with the right gear and necessities. As for any long-distance drive, you always want to check to make sure your car is in tip-top shape. Snow continued to pile up in near-record amounts in the McCall area last week, with blowing snow shutting down local schools again on Monday and Tuesday. As of Tuesday, the total amount of snow that fell in McCall during February was 67 inches, or three inches short of the record 70 inches that fell in February 1975, according to measurements by Payette National Forest. Total season snowfall in McCall was 133 inches as of Tuesday, which was just under the annual average of 135.8 inches, according to the Payette forest. The most snow recorded in McCall by the Payette was 269.5 inches during the winter of 1951-52. That was followed by 235.5 inches that fell during the winter of 1974-75. Brundage Mountain Resort near McCall recorded 132 inches of snow during February as of Monday, or more than three times the monthly average received at the ski area, spokesperson April Whitney said. Brundage had received a total of 278 inches of snow so far this winter, which exceeded the 247 inches of snow that fell for the entire winter of 2017-18, Whitney said. McCall, Idaho (CBS 2) — It’s been a little snowy up in Valley County this month. And the accumulation doesn’t lie. The National Weather Service says there’s about four and a half feet of snow on the ground (55 inches), which is the most since 2008, making this the snowiest February base in more than a decade. But residents in McCall still have a ways to go if they’re eager to break any records. The NWS says, McCall had a February snow depth of 75 inches back in 1952. The weather service is forecasting for — you guessed it — more snow for the remainder of the week. 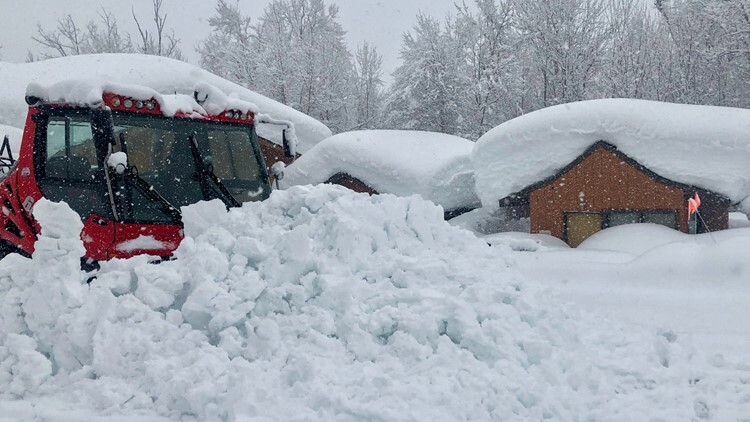 Ketchum, Idaho (CBS 2) — Two homes were damaged by an avalanche in Blaine County late Monday night. Two additional homes were voluntarily evacuated. The debris field also spilled into the Big Wood River. An avalanche also occurred on Highway 75 near Galena Summit — causing the highway to shut down while crews work to clear the scene. An avalanche warning is in effect for all zones in Blaine County and the threat level is high at all elevations. As heavy snow continues, the mountain town has been cut off from the rest of Idaho. Stanley, Idaho — The three highways into Stanley, Idaho, were all closed Wednesday morning as snow continued to pummel the small town at the foot of the Sawtooth Mountain Range. “I suppose you could send a drone with whiskey,” wrote one Twitter account associated with Stanley, Idaho. The ski area is still digging out from the latest storm and will be getting the mountain safe for visitors on Friday. The Idaho Transportation Department says the highway is in pretty bad shape between Banks and Cascade. If you are headed up to the mountains on Idaho 55 this weekend, you might want to take an alternate route. The Idaho Transportation Department says Highway 55 between Banks and Cascade is in pretty bad shape. Officials say using U.S. 95 as an alternate route is strongly encouraged. 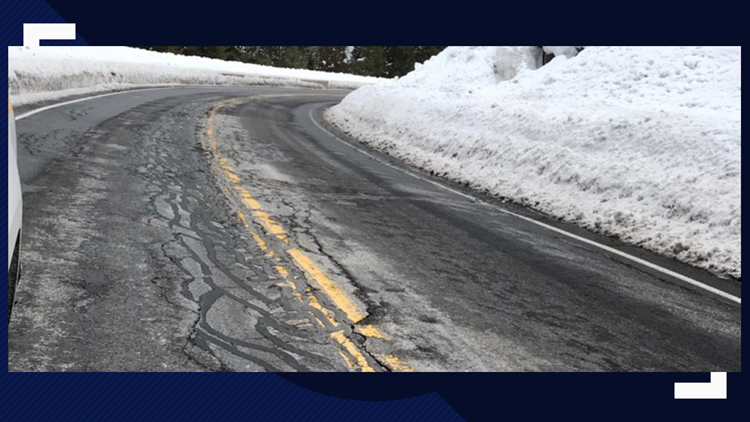 According to ITD, this season’s record snowfall has caused this stretch of road to deteriorate, creating destructive potholes. If you’re planning on traveling around Idaho, especially in the eastern part of the state, make sure to check which highways are still safe to travel on. Boise, Idaho — The Idaho Transportation Department has closed 10 sections of highways across the state, due to extreme winter weather that has created dangerous driving conditions. Idaho mountains have been pummeled with snowstorms in recent weeks and now eastern Idaho is starting to experience the same. Idaho City, Idaho (CBS2) — The rain and snow we’ve seen here in the Treasure Valley this month is nothing compared to what’s piling up in the Boise Basin. Water specialists went beyond Idaho City for a snow survey. … “February has been amazing since Feb. 2. The storms keep coming in so right now the Boise Basin has received 300% of normal precipitation for the month of February… The little wood is up to four times its normal amount,” says Ron Abromavich. Better Business Bureau’s Scam Tracker has seen a distinct rise in phony Social Security calls hitting Idaho. BBB’s Rebecca Barr says their office has also received numerous calls and visitors who are concerned. Scammers are using a variety of tactics to try and scare consumers into giving them personal information, like their Social Security numbers. Barr says the scammers often claim a Social Security number has expired or will be revoked, then make threats of jail time or legal action if the consumer doesn’t respond. The citizens committee formed to consult with Midas Gold about the company’s proposed gold and antimony mine in Valley County has decided to open its meetings. Members of the Stibnite Advisory Council last Thursday voted to reverse a decision they made in January to close the monthly meeting. The meetings begin at 10 a.m. on the second Thursday of each month at the Midas Gold offices on Idaho 55 just north of Donnelly. The meetings will be opened to the public “to listen and observe,” Chair Julie Good of New Meadows said. Anyone who wishes to take part in a future meeting should submit a request to Good prior to a meeting at juliegcitynm @ gmail.com. “Community members with questions or comments for the Stibnite Advisory Council should contact their community representative ahead of the meeting and the representative will present the information to the council,” she said. In January, the group decided to keep its meetings closed in order to “achieve our common goals without disruption or delay,” Good said at the time. Last Thursday, the group decided to reverse its previous decision “after discussing the need to continue to present the public with a clear view of the Stibnite Advisory Council’s purpose, why we are gathered around the table and providing for transparency in our discussions,” Good said. The meetings will be valuable to those who are interested in hearing about the effects the proposed Midas Gold project near Yellow Pine may have on the communities surrounding the project, said Good, who is a member of the New Meadows City Council. Vancouver – BeMetals Corp. is pleased to announce that it has entered into an option agreement (the “Option Agreement”) with Thunder Mountain Gold, Inc. and certain of its wholly-owned subsidiaries, to acquire up to a 100% interest in the South Mountain Project (“South Mountain” or the “Project” or the “Property”) in southwest Idaho, U.S.A. (see Principal Terms of the Option Agreement below). South Mountain is a zinc-silver focused polymetallic development project located primarily on private property, which was the subject of high-grade historic mining up until the 1960’s. The Legislature’s budget committee has approved a 1.7 percent increase — to $68 million — for the agency responsible for safeguarding Idaho’s environment. The Joint Finance-Appropriations Committee voted 20-0 Tuesday to approve the budget for the Idaho Department of Environmental Quality that includes about $29 million in federal funds. Also in the budget is $1.5 million to clean up toxic discharge from an abandoned silver and lead mine upstream from the resort towns of Ketchum and Sun Valley. The Boise National Forest has published its Biennial Monitoring Evaluation Report for Fiscal Years 2016-2017. The Forest revised its Forest Plan monitoring program in 2016 to align with requirements of the 2012 Planning Rule, which is codified in 36 Code of Federal Regulations (CFR) 219. 36 CFR 219.12(a)(1) includes the need for monitoring information that enables the responsible official to determine if a change in Plan components or other Plan content that guides management of resources on the Plan area may be needed. The Biennial Monitoring Report evaluates new information gathered through the Plan monitoring program and relevant information from the broader-scale strategy and makes this information available to the public. The monitoring evaluation report must indicate whether or not a change to the Plan, management activities, the monitoring program or a new assessment may be warranted based on the new information. The Biennial Monitoring Report is also used to inform adaptive management of the Plan area. Any testing of assumptions, another rule-stated purpose of monitoring, would be addressed where relevant to one of the four determinations to be made. The monitoring report is not a decision document representing final Agency action and is not subject to the objection provisions of Subpart B of 36 CFR 219. Please direct any feedback on the report to the Boise National Forest Planner, Tera Little, and send it to: comments-intermtn-boise@fs.fed.us. In the subject line, please enter “Forest Plan Monitoring Feedback”. Yellowstone National Park, Wyo. — Roads in Yellowstone National Park will begin to close to over snow travel on Friday so crews can start to plow in preparation for the coming spring and summer tourist season. The stretch of road from the East Entrance to Sylvan Pass will be the first to close, followed by the stretch from Mammoth Hot Springs to Norris on Sunday. All over snow travel will end for the winter season in the park at 9 p.m. on March 15. A wide-ranging bill that revives a popular conservation program, adds 1.3 million acres of new wilderness, expands several national parks and creates five new national monuments has won congressional approval. The measure is the largest public lands bill approved by Congress in more than a decade. The House passed the bill Tuesday, 363-62, sending it to the White House for the president’s signature. The bill combines more than 100 separate bills that designate more than 350 miles of river as wild and scenic and create nearly 700,000 acres of new recreation and conservation areas. The bill also withdraws 370,000 acres in Montana and Washington state from mineral development. Methicillin-resistant staphylococcus (MRSA) infections are a growing problem in humans and animals. Methicillin is an antibiotic formerly used to treat staph infections, and strains resistant to that antibiotic are commonly resistant to most other antibiotics. A major concern with these infections is the development of staph bacteria that are resistant to all known antibiotics. MRSA infections are caused by a variety of staphylococcal bacteria. These bacteria may normally live on skin, in the nasal passages and in the gastrointestinal tract of animals without causing signs of disease. When a wound occurs, or skin is otherwise damaged or inflamed, these bacteria may take advantage of the loss of normal protective barriers and cause an infection. Most staphylococcal bacteria are susceptible to commonly used disinfectants. Transmission is by direct contact with infected people or animals. Most MRSA infections are associated with wounds or skin diseases like skin allergies, or atopy, and sometimes at surgical sites. Infections caused by MRSA do not clinically look different from other infections. In humans, MRSA infections may resemble spider bites, but not in animals. Boise, Idaho (AP) – Idaho Gov. Brad Little has signed into law legislation to keep operating a state board that pays a federal agency to kill wolves that attack livestock and elk. Little signed the legislation Wednesday to repeal a section of Idaho law that would have ended the five-year-run of the Idaho Wolf Depredation Control Board in the summer of 2020. The board asked for the change and says Idaho has too many wolves that are harming ranching and farming families by killing livestock. Those who opposed the bill say it should include non-lethal methods of wolf control. Helsinki — Estonian construction workers got the shock of their lives when they found out the animal they saved from an icy river was not a dog but a wolf. Salmon, Idaho (KIFI/KIDK) – Salmon-Challis National Forest Supervisor Charles Mark is calling for an update of interagency grizzly bear management planning. He is concerned for areas located outside designated recovery zones. Mark serves as Chairman of the Bitterroot Ecosystem Subcommittee of the Interagency Grizzly Bear Committee. In an open letter to the committee, Mark said the Bitterroot Ecosystem has one of the largest blocks of unoccupied grizzly bear habitat in the lower 48 states. He said grizzly bears do not currently occupy that ecosystem, but “natural recovery” efforts may soon change that. Pocatello, Idaho (KIFI/KIDK) – Idaho Fish and Game Department officers are creating an elk bait site on the west side of the Ninety Percent Range in Caribou County. The step was authorized by the Idaho Winter Feeding Advisory Council to bait approximately 200 elk from a landowner’s property. There has been no winter-feeding emergency declared for wildlife in southeast Idaho. The baiting effort will help alleviate interaction between a herd of elk and a landowner’s livestock. The concern is that elk will come into livestock feedlines. Ranchers are concerned about the potential for spreading brucellosis or other disease that can be transmitted between elk and livestock. A benefit for the South Fork of the Salmon River will be held at the Alpine Playhouse on Saturday, March 9, starting at 7 p.m. The evening will be a tribute to the river and those fighting to protect it as well as the wildlife, fish and the health and culture of surrounding communities from the effects of the proposed Stibnite Gold mine. The event will feature a presentation by the Nez Perce Tribe, performances by Latin guitarist Tomas Rodriguez and friends, a special visit from Ms. Salmon River Watershed and her partner Mr. Payette River Watershed, and refreshments. Doors open at 6:30 and donations will be welcomed. The event is sponsored by Better Neighborhoods and Save the South Fork Salmon. Gamebird foundation meeting and board meeting March 5th , 5:00 PM at the Viola community center in down town Viola, Idaho. Guest and members welcome. Some agenda items will be, new 1700 acres we will have for youth hunting along with the 800 acres we have now. This property will be in several different parcels. We want to visit about the Idaho Department of Land (IDL) that sportsmen pay rent for and we want to be able to use it. There will be many other things on the agenda we can talk about. WE WANT TO TALK ABOUT BROODERS, SOFT RELEASE PENS AND BABY CHICKS. There is always popcorn on the table and you never know what else. BE THERE. Also we will be discussing the Meeting that we will have at the Community center on March 30th. IDFG will be here explaining Land Owner Access and some of our new Ideas, also some of the many opportunities for help with habitat enhancement. Need your ideas. Idaho Fish and Game and its winter feeding advisory committees continue to monitor conditions in light of snowstorms, and through late February, there was still no need for large-scale, emergency winter feeding. The latest batch of snowstorms to come through Idaho have pushed the snowpack for nearly all of the state’s drainages above their respective averages, according to the National Resources Conservation Service. At the end of February, snowpack ranged from 91 to 153 percent of average, with a majority of drainages running between 110 and 130 percent. As anxious shed antler hunters prepare to take to Idaho’s hills in search of fresh bounty, the Idaho Department of Fish and Game urges them to avoid stressing wildlife trying to survive the late winter storms. Shed antlers from deer, elk and moose are commonly found in areas where they spend the winter months. Typically, mule deer and moose shed in late December through January, and elk shed from mid-winter through April. While there are no seasons directly related to shed hunting in Idaho, unfortunately, many take to the field to gather antlers during the worst time of the year for the animals. The Idaho Fish & Wildlife Foundation is accepting applications for its 2019 grants cycle. The grants program provides funding on a competitive basis to nonprofit organizations, the Idaho Department of Fish and Game, and tax-exempt organizations. This entry was posted in News 2019 on March 3, 2019 by The Yellow Pine Times.